[UPDATED: 2018-04-12 @ 2318 UTC] The sunspot numbers have not been good, and it does not seem they’ll be getting much better anytime soon. 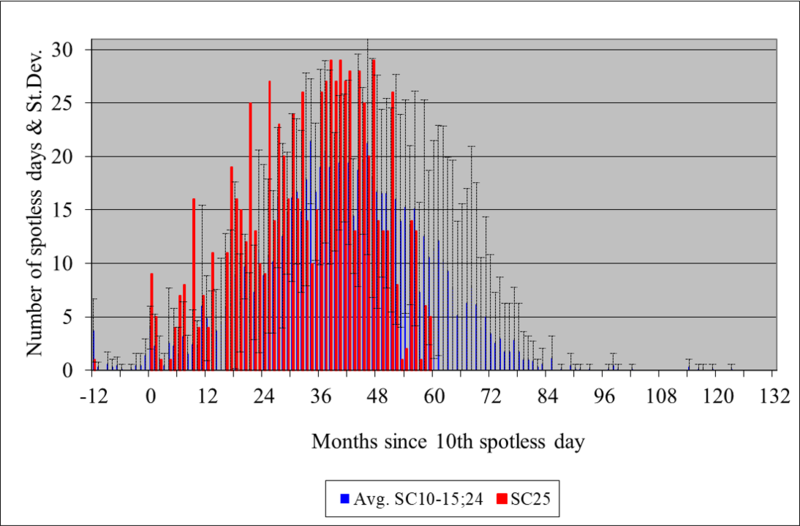 According to the April 6 “K7RA Solar Update,” only 2 days of the March 29 – April 4 reporting week saw sunspots, and that was at the bare minimum. No sunspots showed at all for the previous reporting week. Solar flux has been sitting in the 60s lately and are forecast to remain at that level for the next 45 days. Better days lie ahead — eventually. Top contester Frank Donovan, W3LPL, asserts that solar precursors like spotless days, which correlate physical solar phenomena with future solar activity levels, are much better indicators of progress toward a solar minimum — a broad phase of the solar cycle — than of a specific event, such as the bottom of a broad solar minimum. Not only that, these and other solar precursors are useful in predicting the likely strength of Cycle 25, although accurate predictions of the strength and timeframe of the Cycle 25 solar maximum aren’t possible until the new sunspot cycle is under way. The frequency of spotless days accelerated in early November 2017, with 13 spotless days in a row. That was followed by many more spotless days over the next 5 months. In all, 2017 experienced 104 spotless days (see chart). He takes issue with reports suggesting that the solar minimum has arrived, based entirely on the very frequent incidence of spotless days over the past 6 weeks. “More comprehensive physical evidence suggests it’s more likely that we’ve just begun a lengthy deep solar minimum phase — similar to late 2007 through late 2008 — that’s likely to last well into next year,” he told The Daily DX. He said solar polar magnetic field strength peaks at least 1 year before solar minimum, and, while the south polar region peaked last year, the north polar region has not yet done so, suggesting that solar minimum is not likely to occur until 2019 at the earliest.